CAMPBELL, CA--(Marketwired - January 07, 2015) - Infonetics Research, a technology market research firm, today released excerpts from its third quarter 2014 (3Q14) SAN and Converged Data Center Network Equipment report. In the report, Infonetics, now part of IHS Inc. (NYSE: IHS), tracks storage area network (SAN) Fibre Channel switches and host bus adapters (HBAs), converged data center network adapters, and switch ports-in-use for storage. 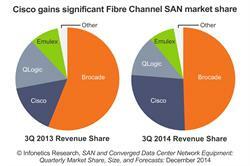 "The long-term downward streak for Fibre Channel SAN equipment was broken in the third quarter of 2014 (3Q14), driven by high performance requirements for flash storage and Cisco's customers finishing their SAN product evaluation cycles and beginning to scale deployments," notes Cliff Grossner, Ph.D., directing analyst for data center, cloud, and SDN at Infonetics Research. "The question remains, however, whether the growth expected from solid-state drive storage and Gen 6 Fibre Channel that's expected in the coming year will be enough to return the market to increased growth," continues Grossner. 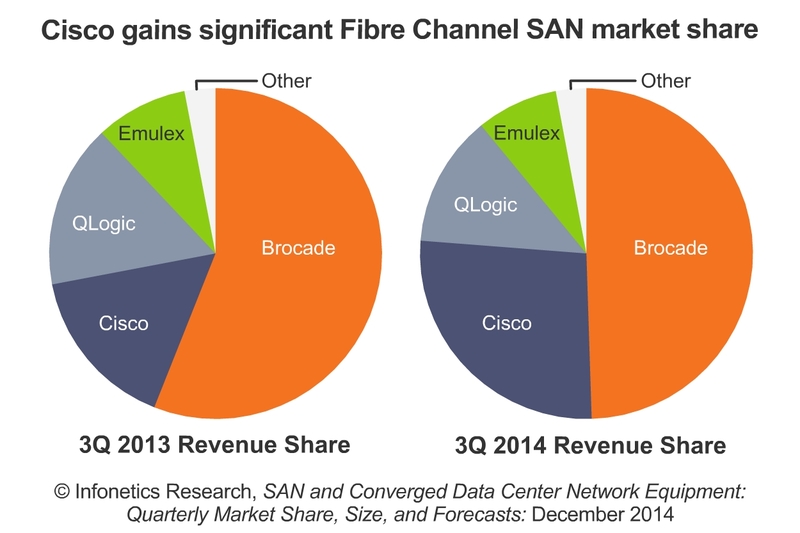 "We believe the answer is yes for the short term, but do not see any evidence that double-digit growth will return to Fibre Channel market." Infonetics' quarterly SAN equipment and converged data center network report provides worldwide and regional market size, vendor market share, forecasts, analysis, and trends for chassis and fixed Fibre Channel switches; Fibre Channel HBAs; converged data center switch ports-in-use for storage (iSCSI, FCoE, FC-to-FCoE); and converged data center network adapters (iSCSI, CNAs, universal). Vendors tracked: Alcatel-Lucent, Arista, ATTO, Brocade, Cisco, Dell, Emulex, HP, IBM (BNT), Intel, Juniper, QLogic, others. To buy the report, contact Infonetics: www.infonetics.com/contact.asp. Download Infonetics' 2014 or 2015 market research lineup, publication calendar, events brochure, report highlights, tables of contents, and more at www.infonetics.com/login.